The Chevrolet Suburban has been around since 1935, making it the longest-running nameplate in the American auto industry. The Suburbans of the `Thirties through the 1980s were sturdy, rugged trucks capable of dealing with poor roads and carrying plenty of people and cargo. They were panel trucks with windows, commercial vehicles adapted for passenger use, emphasizing utility over comfort. Great machinery for rural life, but not something that would be smiled upon in the front parking lot of an upscale country club. That was then. Now, when I check out the vehicle population in the upscale suburb nearest to me, sometimes it seems like there is nothing but Suburbans, along with their slightly smaller Tahoe derivatives and cousins from other GM divisions. I'd wager that the members-only parking lot at the country club looks pretty Suburban at tee time on Saturday morning. But a Suburban is more than an upscale status symbol, as I discovered after spending the week with one. In upscale LT trim it offers all the appointments of a luxury car, with considerably more space and towing or hauling ability. It'll haul plenty of kids, dogs, and groceries. And a trip to the building supply store likely won't require renting a trailer. In short, today's Suburban offers all of the rugged truck ability that made the name, in luxury comfort. APPEARANCE: There are no changes to the Suburban's sheet metal for 2003. Like all since the current generation debuted in model year 2000, it's not ashamed to be a truck. If not quite the box it came in, it's close. A Suburban is moderately tall and wide, and long, very, very long. The corners and edges are rounded off, and the sides have small fender flares and a strong shoulder line. COMFORT: In a Suburban, length is no illusion, and, if passenger and/or cargo space is important, length is a friend. It seems like all SUVs, even small ones, now are available with three-row seating. But the space in the third row of a compact or even mid-sized sport-utility is best for small children, not full-sized adults. Not so inside a Chevy Suburban. Depending on configuration, it holds seven to nine people, with plenty of leg and head room. Even in four-wheel drive form, it's not too tall for easy access, and optional running boards help make one big step into two smaller ones. First and second rows may be benches or buckets, with a third-row bench. My test `Burb LT was outfitted for seven, with leather-covered front bucket and second-row captain's chairs and the third-row bench. If, in LT trim, it costs as much as a luxury car, it is also as comfortable as a luxury car, and roomier. The bucket-type seats offer very good support and comfort, and have belt-to-seat shoulder straps that are always adjusted correctly for safety. At the LT level, the front seats are power-adjustable and heated. The second-row captain's chairs have reclining backs, and flip and fold for extra cargo space. The aisle between them makes access to the third row easy. The third row seat has good head and leg room, but, being between the rear wheel wells, it is on the narrow side for three large adults. Three smaller people fit fine, and there are storage spaces and cupholders for them. The third row seat tumbles forward or can be removed when cargo is more important than passengers. Back up front, adjustable pedals increase driver comfort and safety. The instrument panel is the standard GM truck one. No complaints there, control and instrument layout is very good, and can be enhanced with the new optional steering-wheel auxiliary controls. Good audio systems, including available XM satellite radio, and an available rear-seat DVD entertainment system help make the Suburban a great long-distance machine. SAFETY: A strong frame and body structure, with a safety cage around the passenger compartment, and four-wheel antilock disc brakes have been Suburban features since 2000. Dual-level front airbags and a front passenger sensing system are new this year, as is the StabiliTrak stability enhancement system. ROADABILITY: Around town or on the highway, the Chevy Suburban is a comfortable cruiser capable of covering distance effortlessly. Its long wheelbase improves its ride quality over the already good ride of the short-wheelbase Tahoe. The tradeoff is in a wider turning circle, which makes tight parking maneuvers trickier. Here, the heavy-duty 2500 models actually have an advantage, as they can be ordered with the ``Quadrasteer'' four-wheel steering system. I've experienced Quadrasteer in several pickups, and it works very, very well, especially for towing. 1500s have coil springs with five-link rear axle location, which helps give them a very un-trucklike ride. The 2500s have a more traditional truck rear suspension, with the axle mounted on semi-elliptic springs. 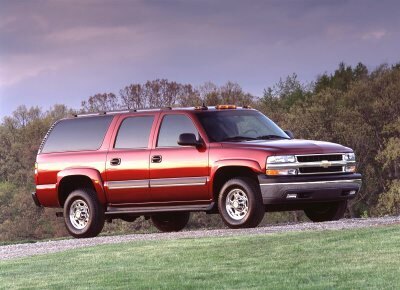 PERFORMANCE: If, while reading the specifications, the standard 5.3-liter Vortec V8 seems a touch on the small side for the 5200-lb Suburban, don't believe everything you read. Its 285 horsepower and 325 lb-ft of torque are considerably more than adequate. Acceleration is never a problem, and hills are largely ignored. Electronic throttle control, new this year, allows better response and easier integration of engine, transmission, and stability management systems. The four-speed electronically-controlled automatic transmission shifts smoothly. The Suburban 1500 has a towing capacity of 8100 lbs in 4WD trim, or 8400 with two-wheel drive. 2500 models can tow up to 12,000 lbs. Don't try that with a luxury car. CONCLUSIONS: The Chevrolet Suburban combines space and luxury comfort with serious towing ability. Engine Size 5.3 liters / 327 cu. in. Wheelbase / Length 130 in. / 219.3 in.